While at the beginning of the year we were concerned with the potential need for additional rate hikes, by the 22 March meeting the near-term risk profile has improved and no longer points at the need for tightening. A less hawkish stance by the US Fed and easing in the China growth concerns have contributed to global risk-on towards Emerging Markets (EMs), contributing to around a 50 basis point decline in yields in Russia's EM peer space and ~1.5% EM FX appreciation to the US dollar (USD). 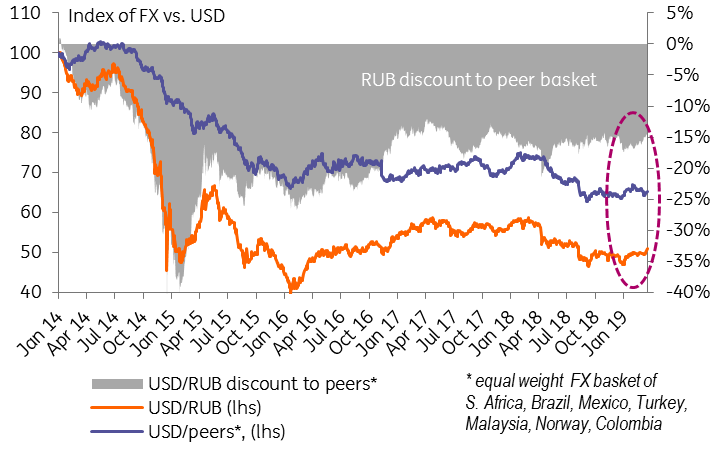 Global risk-on, combined with a recovery in oil prices, favourable BoP seasonality and moderation of perceived sanction risk perception contributed to the return of portfolio inflows into local state bonds (OFZ) and the ruble's (RUB's) 8% YTD appreciation to USD, outperforming peers. Some recovery in the RUB exchange rate following its 17% depreciation in 2018 has resulted in an improvement in the corporate inflationary expectations, as February was the first month which saw a decline in the share of polled companies expecting an increase in the price pressure in the next 3 months - for the first time since the end of 2016. Earlier the Central Bank of Russia (CBR) had stressed the deterioration of corporate inflationary expectations (driven by expectations of VAT hike and ruble depreciation) as an important hawkish argument. Government-brokered freeze in gasoline prices and RUB strength have somewhat muted the effect of VAT and excise hike on the local CPI, causing it to accelerate more modestly than expected - to 5.2% YoY in February and most likely 5.4-5.5% YoY in March. The households' inflationary expectations somewhat moderated in February. The likelihood of CPI hitting the CBR's 'line in the sand' level of 6.0% has now lowered, and we see CPI peaking at 5.7% YoY mid-year. The representatives of Central Bank have already guided the market towards some easing in the official rhetoric, indicating this month that the market conditions have improved and the official CPI forecast, which assumes 5.0-5.5% for year-end 2019 and 4% to be reached sometime in 1H19, might be improved. 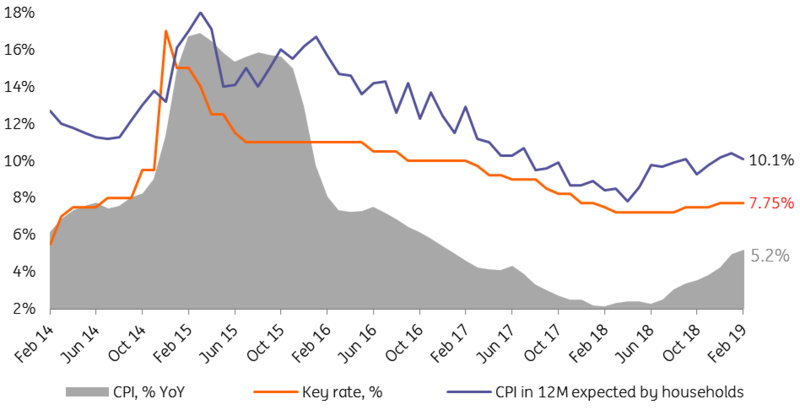 We expect the CBR to deliver on the promise, likely softening the wording vs. the previous press-release and somewhat lowering its CPI expectations. In the meantime, we do not think the CBR would be in a rush to ease immediately following this meeting, as the mid-term risk profile favours a cautious approach. The prospects of the gasoline price freeze, which expires at the end of this month, remains unclear. Gasoline's direct weight in the CPI basket is 4%, yet the total effect on the CPI through transportation costs is higher. The RUB strength, which might have weighed on CPI in 1Q19, may prove temporary, given the volatility of the global risk sentiment and the weakness of the Russian balance of payments in 2-3Q, as we had mentioned earlier. 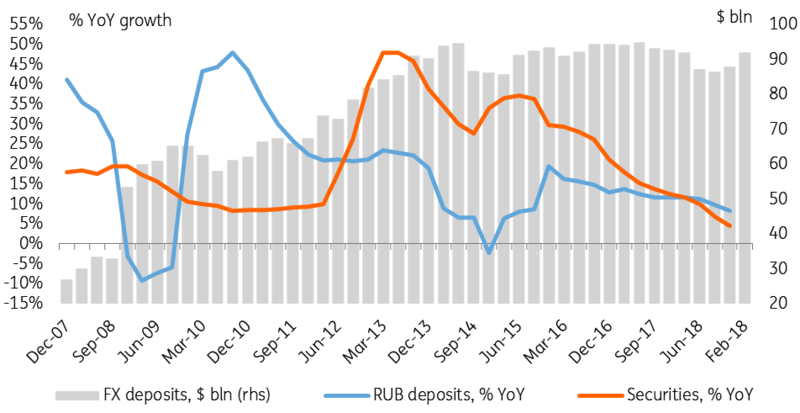 RUB66-68/USD remains our base-case scenario for 2-3Q19. 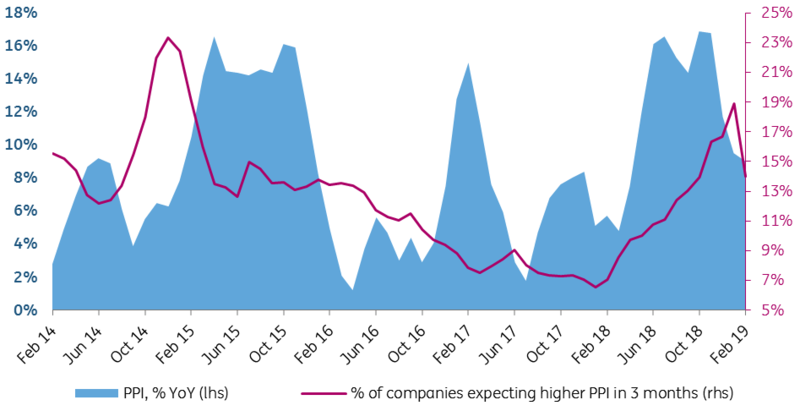 Given the recent social policy initiatives by the president, combined with the scheduled increase in public sector salaries later this year, there is a possibility of a pick-up in consumer activity in 1H19, removing some of the current demand-side constraints to CPI growth. A current decline in the population's RUB saving's rate, as suggested by the deceleration in RUB deposits and securities holdings amid a recovery in FX deposits, should be seen as an additional argument in favour of keeping the key rate on hold, at least until inflationary and RUB expectations see sustainable improvement. We expect the CBR to keep the key rate at 7.75% at the upcoming meeting and to improve its year-end CPI expectations towards our 5.0% forecast. The persisting mid-term uncertainties regarding global risk appetite, local RUB drivers, gasoline prices and the households' savings rate favour a wait-and-see approach over the next couple of quarters. A return to the rate cut cycle is possible in 4Q19, provided there is a confirmation of sustainable improvement in local CPI expectations.